Because we always strive to learn new things around here . . .
. . . my son with a magnifying glass. Thats a really neat picture to have taken. Thanks for sharing it! That is an awesome photo! Happy WW! That's so cute! How funny. I'm visiting from Five Minutes for Mom. Such a fun neat picture! Very cute! 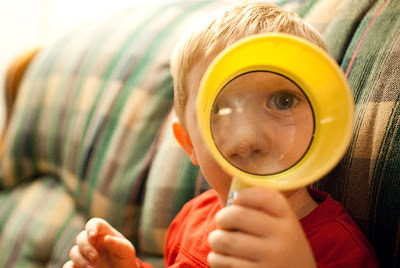 We have a magnifying glass obsession around here too-very fun! I see you!!! My kids love magnifying glasses too! Enter to win a Tailgating Kit from Libby's Vegetables!! Great shot...a keeper! Happy WW!